In the Christian religion, Easter Sunday is the most important holiday of the liturgical year since the literal physical bodily, resurrection of Christ is the foundation of all its beliefs. Since my mother was a devout Polish Roman Catholic, Lent and Easter maintained its importance in our household while our Italian side of the family was more into celebrating Christmas. The prelude to Easter is the season of Lent which starts on Ash Wednesday, the day after the indulgent holiday of Carnevale or Mardi Gras. My mother took us to church that day to receive ashes. Since my father was sick with Parkinson’s disease and couldn’t make it into the church, the priest gave my mom some ashes in a #6 size white envelope. When she got home, she put the ashes on him and said with some sangfroid, “Dust you are and dust you shall return!” Lent lasted forty days in preparation for Easter – a symbolic time referencing the Old Testament tale of Moses and the Jews wandering in the desert and the parallel New Testament story of Jesus fasting in the desert on honey and locust, preparing himself for his ministry. At Sacred Heart School, the nuns urged us seventh graders to “give up something” for Lent like candy, movies or TV. They handed us small cardboard Lenten Boxes that you had to assemble (Tab A into Slot B) to put coins in to save the pagan babies of China. We were allowed only one full meal per day with meat, which meant a lot of cheese, tuna and peanut butter and jelly sandwiches for lunch. During Lent, there was no meat at all on Fridays. So going to Howard Johnsons on Friday night for the unlimited fried clams was a special treat and didn’t seem like a penance at all. On Easter Sunday, we were always outfitted in a new suit and hat symbolizing our rebirth and fresh start in Christ. So, weeks before, my mother took us to Robert Hall to buy a new suit, which came with two pairs of pants. She would then go to S.S. Kresges to get a new frock and an Easter Bonnet (“does anyone still wear a hat?”). You did not go to Church on Easter Sunday morning with anything old on! 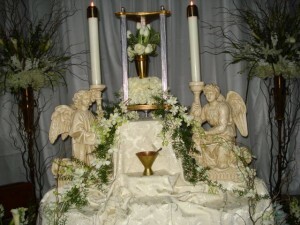 Sacred Heart Parish in Newburgh New York was mainly comprised of Italian Americans so our Polish celebration at home was in contrast with the over the top Mediterranean liturgical celebration. For instance, during Lent, all the many statues in church were covered in purple cloth like ladies wearing veils to cover their heads for vanity. For forty days, the organ was silenced, no bells rung and no weddings held. 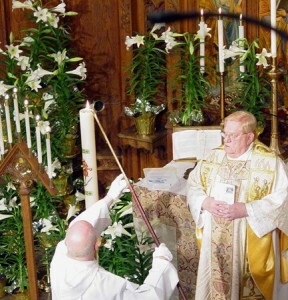 As an altar boy, I loved clacking a large wooden clapper only used at mass during this season. For Forty Days and Forty Nights all the parish repented, gave alms, fasted, and attended the “Stations of the Cross.” We cleansed ourselves of evil and the pleasures of the material world to enter the Promised Land. We had fattened up the weeks before Lent to get us ready for the fast and we all looked forward to Easter and the great celebration and feasting that began with Holy Week that started with Palm Sunday. After Mass, everyone received palms in memory of Christ’s entry into Jerusalem on a donkey when the throngs waved their fronds to greet the Messiah. I would take my palms home and make little crosses of them. We would wear these on our suit lapels and put them around the house usually stuck onto the corners of mirror frames or over our beds. The old, Italian ladies of the parish made and sold elaborate palm crosses to put on the graves of loved ones. These days were spent shopping for fish for Good Friday and Polish meats and groceries for the big meal on Sunday. We went to Commodore’s on Broadway to buy homemade chocolate Easter Bunnies, jellybeans and the A&P to buy yellow Peeps and Paas egg coloring. Spy Wednesday was named for Jesus hiding from the magistrates and the priests of Jerusalem. The evening service commemorated Jesus washing of the feet of the apostles at the Last Supper. Our pastor washed the feet of the big parish donors. At the end of the service came the stripping of the altars of all cloths, flowers, candles and adornment even the holy water fonts were drained. The door of the tabernacle was left open and the Blessed Sacrament was transported downstairs to the basement of our church to a special repository. Since no mass could be celebrated for the next two days, this is where the concentrated hosts were “reposed” in case the sick and dying needed to take their last communion. Since ours was an Italian parish our repository was quite gaudy. Lots of candles, aluminum foil backdrop, palms, lilies, kneeling angels in adoration framed the altar where Jesus was in wait till Sunday. One very old, Italian lady, my mother called, Penny Annie, stayed all night in the basement to keep Jesus company. After the Thursday night mass, my mother and I would visit Newburgh’s other two parish’s repositories to gain a special indulgence: St. Francis Church for the Polish immigrants and St. Patrick’s for the Irish of course. 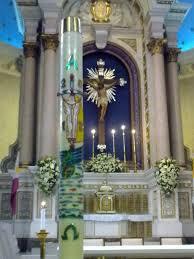 This was called Visita Iglesia. This is the most somber day of the calendar, the day the Lord was crucified. There was no school and my parents came home from work at noon. No music or TV or Radio could be played at home. I think it is called “Good” Friday, because without the death of the Son of God there would be no salvation so it was good. This is a sort of ironic Christian logic not un-similar to “if it rains on your wedding day, it is good luck”. From noon to 3 p.m. in the afternoon, the duration Jesus spent on the cross, we would attend the service of readings on the Passion. Some called it the “Seven Last Words.” During the service, all the congregation would come to the altar rail for the Adoration of the Cross, kneel and kiss the wounds of the crucified Jesus on a big wooden cross. The priest would rub the rood clean with a handkerchief after each dramatic buss. That night we attended “Stations of the Cross”, services which we went to every Friday evening during Lent. These centered around thirteen depictions of the passion of Christ hung around the church in chorological order from Pontius Pilate to the Crucifixion to the Sepulcher. These barbarians fastened him with nails, and then, raising the Cross, leave Him to die with anguish on this infamous gibbet. Mom baked a ham, boiled the eggs and kielbasa and made potato salad. In the afternoon, we dyed our Easter Eggs with the Paas brand coloring kit. You had to dilute tiny colored tablets in white wine vinegar. Like Proust, whenever I smell white vinegar, I think of Holy Saturday, my mom and times past. We inscribed our names on the brightly pastel colored eggs with a wax crayon; Mom, Dad, Anthony, Michael and Karen. Even one for our dog, Daisy. In late afternoon, we all went to confession except for my father. In the evening was the great Easter Virgil Service at our Italian parish of Sacred Heart Church that had to begin after sundown and lasted for three hours. We forget how much Catholic liturgical days, calendar and rites derived from the Jewish tradition. The holiday or “Holy Day” celebrations always start on the eve before and continue for eight days – Octaves. 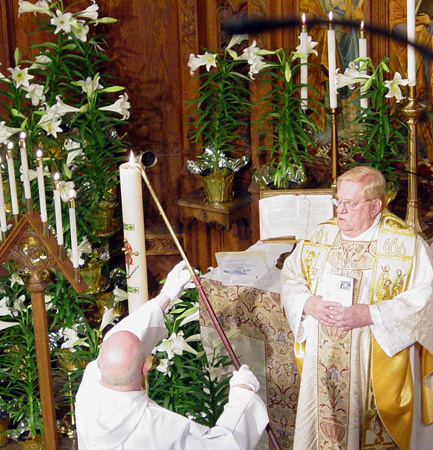 The great Easter Vigil service was in four parts, the first being The Service of Light. At 10 p.m., dressed in my altar boy special red cassock and white lace surplice, I followed the high priest, deacon and sub-deacon outside to the rickety wooden front steps of our church. While inside the darkened church, the congregation waited in silent anticipation, holding unlit candles which poked through an upside white and green trimmed Dixie Cup to prevent drips. I used to love it when the hot wax dripped on my hand and I would eat it off. The celebrant after a few frustrating attempts, struck a flint to start the blessed fire to light the big Pascal (lamb) Candle made from beeswax that would burn till Pentecost (50 days later). He handed it over to the deacon for the grand procession from the main doors of the church and down the center aisle of the black, dark silent building. From the great Paschal Candle, a flame was passed from one congregant’s small candle to the next slowly illuminating the nave. As the deacon made his way down the center aisle, he stopped three times lifting the candle higher and higher intoning Lumen Christi – Light of Christ, each time singing in a higher key as the congregation responded Deo Gratias – Thanks be to God. When he reached the main altar, the Paschal Candle was set in a large ornate golden candelabra where it would flicker fifty days and nights to Pentecost. The second part, The Liturgy of the Word began as the deacon chanted the beautiful Exsultet or Easter Proclamation. This was followed by seven readings from the bible, five from the Old Testament including the Exodus narrative and two from the New. When we got to the “Gloria” part of the mass, the church lights were dramatically turned on and all the church bells were rung for the first time in forty days. I went wild with my communion hand brass bells as the choir, accompanied with organ which had been silent since Good Friday, joyously sang out: Gloria in Excelsis Deo. Another altar boy swung his thurible in great arcs as clouds of incense wafted over all of us. Ushers, stationed by all the Lenten covered statues, holding a stick with a nail on top of it, whipped off the purple cloths. Boo! Then the sacristan crouching off to the side, drew back a huge white sheet hanging in front of the main altar. It was dramatically torn down Kabuki style like the rending of the veil in the Great Temple of Jerusalem when Jesus died. Voila! It revealed the resplendent altar filled with hundreds of lit candles and Easter Lilies surrounding a four-foot statue of the triumphant resurrected Christ. I almost swooned from such an overwhelming dramatic and emotional experience of the bells, the music, the incense, the flowers, the heat of the candles and the almost naked muscular statue of Jesus. It was like the rock was rolled away on Easter morning and all of creation shone out enveloping us all in a Bellini St.Teresa-like ecstasy. I believe this is where my love of theatre and special events was born. After The Liturgy of the Word came The Renewal of Baptismal Vows. The water for the baptismal font which had been drained on Good Friday was solemnly blessed and basins filled. Then our Monsignor walked down the center aisle dipping the aspergillum from a brass bucket filled with the new water and sprinkled all the parishioners as we renewed our baptismal vows. The sub-deacon chanted the long Litany of the Saints with invocations to the Virgin Mary, Apostles, Martyrs, Bishops and Doctors of the Church, Priests and Religious and us Laity. Many of the names I never heard of – Matthias, Cyprian, Perpetua, Cyril and Fabian? It was now time for the final section called The Eucharist. The main celebrant changed from violet vestments to a white chasuble embroidered with gold thread to celebrate the first mass in two days. If you had gone to confession this Saturday afternoon, you could now receive communion and fulfill your Easter Obligation. It took all three celebrants to give out communion since nobody dared not receive the Body of Christ on this most holy day. There was more passing of the basket for the final collection as we all exited singing “Christ the Lord is Risen Today – All-all all lea-lu-lu ia” It was 1 a.m. in the morning. And the stone was ready to be rolled away at dawn. We got up at sunrise and opened our Easter Baskets. We got dressed put on our new Sunday clothes and went back to church for the Children’s Mass at 9 a.m. For most parishioners, it was difficult to understand our Italian accented pastor but I had no problem since my Aunt Mary spoke the same way! After mass, we stopped at Luna Bakery, the neighborhood Italian Pastry shop, for cannoli as dessert after our splendid Easter afternoon meal. Easter lunch was at 1 p.m. – baked glazed Krakus Polish Ham, kielbasa and red horseradish, potato salad and overdone string beans that looked brown – cannoli and Easter candy for dessert. We stayed in new garments even as we cleaned up all the dishes and pots. At 3 p.m. we drove back into Newburgh for a walk around beautiful Downing Park to see the spring flowers plantings. My father’s favorite pastime was feeding the corn to the ducks in the pond from a brown paper bag he bought at the park concession stand for 25 cents. The next morning, I would get up extra early around 6 a.m. It was Dyngus Day! It was a Polish tradition for the boys to get up early so they could douse the girls with water as symbol of baptism of a new life in Christ (christening). I am sure it was based on some sexual pagan rite too. First I would sneak to my mother’s room and throw a spritz of water on her. She pretended to be asleep and would scream and feign anger. I then slowly crept up the stairs and doused my sister Karen who was sound asleep with a small cup of cold water and she screamed too but with not unreal anger. The rest of the week was filled with the debris of eggshells, foil wrappers from the chocolates, squashed jellybeans that had fallen to the floor and trampled by our shoes. We all enjoyed variations on the leftovers. I particularly liked scrambled eggs with chopped up ham and kielbasa. We continued to water our Easter plants till they died usually around Pentecost. The following Saturday I vacuumed up the green cellophane grass which had fallen out from our Easter Baskets and somehow always found their way into the corners of our living room. We put all the holiday decorations back down in the basement. The Sunday after Easter is called “Low Sunday” after the high celebrations of Eastertide. At home and at church, what an apt name that was.